Keir Starmer is in Brussels today, where he will meet with EU officials and warn against a “blind Brexit”, which could “prolong business uncertainty and provide insufficient guarantees to protect jobs, the economy and rights”. The Shadow Brexit Secretary will emphasise that, although the government has very little time left to agree with itself and the EU on a comprehensive deal, what finally comes before the Commons must be a “detailed, precise and substantive” document. That, after all, is what Theresa May and Dominic Raab have promised to deliver. 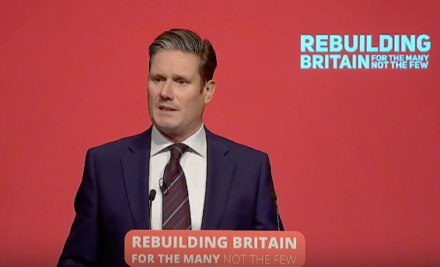 Starmer’s comments refer to the prediction many have made that after months of Tory party and cabinet deadlock, the Prime Minister will only present a light-on-detail political agreement to MPs rather than one that offers specifics on post-Brexit trade, customs, immigration, security and other arrangements. While Labour prepares its reasons for voting against the deal brought to the Commons by the government, the Westminster bubble is talking about an extraordinary leak. Last night, notes were passed to journalists that look like a PR plan to help the government sell its Brexit deal. The BBC has the full text. Weirdly, it hopes that the Tories will get Andy Burnham on board as a supporter of the deal, though doesn’t mention Labour Leavers. Pointing out the document’s “misspelling and childish language”, No.10 says it “doesn’t represent the government’s thinking”. But it contains plenty of insider knowledge and a cabinet source told The Times that it has “all the hallmarks of Robbie Gibb” (May’s comms director). From the left’s perspective, particularly the pro-EU left, the most interesting news of last night came from Momentum. As you may remember, a Momentum member started a petition in favour of a ‘people’s vote’ on Brexit, and it gathered the required number of signatures (4,000) to oblige the organisation to hold a consultation of members. The executive delayed this survey until after Labour conference, but we now have the results. 41% of Momentum members surveyed support another Brexit referendum “in all circumstances”; a further 12% support it if there is no chance of a general election; only 17% did not want it at all. Since we know, speaking frankly, that our chances of forcing a general election are low thanks to the Fixed-Terms Parliament Act, basically a total of 53% back a ‘people’s vote’. These answers have given pro-EU, pro-Corbyn (#PCPEU) groups a boost: it shows that even on the firmly Corbynite left of the party, support for another referendum is strong, despite the leadership and most MPs resisting calls to endorse one.